Scott shared this on Facebook recently. 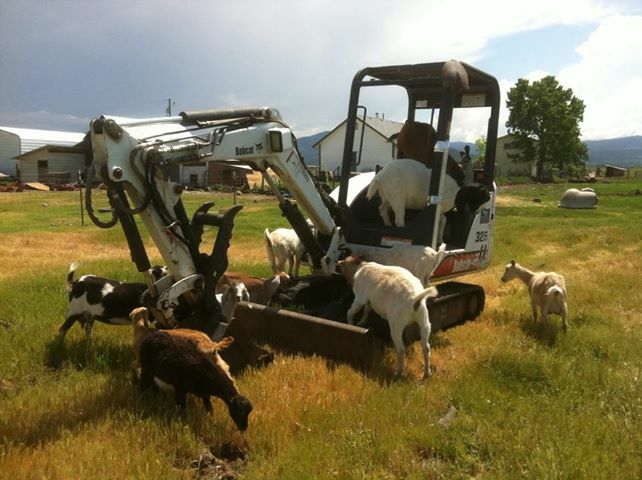 I think it is a nice depiction of our crazy goats. This morning, we changed up the chores. We have so many more animals this year than we did last year at this time, that we spend all morning feeding, watering, milking, and cleaning up after animals, and our garden is still barely in. Today, Scott suggested that I spend all morning (all chore time, that is – all the way up until 6:25 when it’s time to wake up Ben and start getting him ready for school) in the garden. I had forgotten what a peaceful brilliance there is in the early morning in the garden. I worked up a sweat hacking away at invasive, 3-foot tall weeds in between our rows. We have plants in place, we just don’t have the weeds completely gone from all around the edges and in betweens. What had slipped my mind until today was the rich, wild and unruly smell of weeds being dealt with early in the morning. There’s an aroma that is almost other-worldly. It doesn’t smell like anything you would want to cook, just something you might try eating if all else fails. A peppery scent, a deep and dark scent, heavy, and wafting over the still morning. Wild, like there were recently nymphs or dryads dancing here. Almost, you could imagine drums and hoofbeats of fauns leaping about in this now quiet place with precious, baby sprouting plants all around. Perhaps they came to bless it. I must admit, Narnian imagery is never very far from my mind. As I weeded, knowing that my goats, rabbits and chickens would delight at my harvest of greenery for them, I thought of my family, and the fun we have. I thought of all the work this place is, and how there is no work I would rather be doing. I thought of Scott’s impressions of the different animals and their personalities. We have possibly the most over-the-top Drama Queen goats in the world. When Scott first started telling me that the goats wouldn’t get into the milking stand until he’d walked out of the barn, and come in again through the side door, I thought He’d lost his mind. Maybe someone else would stand their ground and make the goats do as they are told, but not Scott. He feeds into their dramatic tendencies, for the fun of it, I think. Sweetheart wouldn’t settle down one day because Scott was wearing a black jacket instead of his usual grey one. She gave him such looks of discontent, that he took the jacket off and hung it on a hook on the wall. That wouldn’t do AT ALL. Then it was this horrible black thing hanging on the wall. So he folded it nicely and put in on a table in the milking area. Sweetheart was practically braying, she was so worked up over that. So, he took the jacket and put it in a completely different part of the barn. Then she was appeased. Every day, he comes in with stories of the things these goats do, and the things he has to do to make it all work, and we are usually in hysterics as we try to serve up breakfast. And I thought of how grateful I am that in our family, we mostly laugh.